Tickets: $25 For reservations call 773.904.0391 and mention "Theater Thursdays." It’s a good thing there’s an afterlife in The Last Daughter of Oedipus or we mere mortals could easily write off its heroine, Ismene (Kimberly Logan), as a failure at everything she attempts in life. 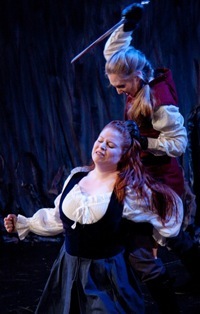 With her new play, produced by Babes With Blades at Lincoln Square Theatre, Jennifer L. Mickelson totally revises Ismene’s traditionally meek and incidental role in Classical myth and literature. More importantly, Mickelson re-imagines her heroine within absolutely appropriate parameters of Ancient Greek religion. The characters of this drama thoroughly believe in the gods, in prayer, in ritual and in the less glowing side of Greek religion, the shadowy beliefs about the supernatural and the underworld. Classical geek alert: The Last Daughter of Oedipus is mythologically correct. 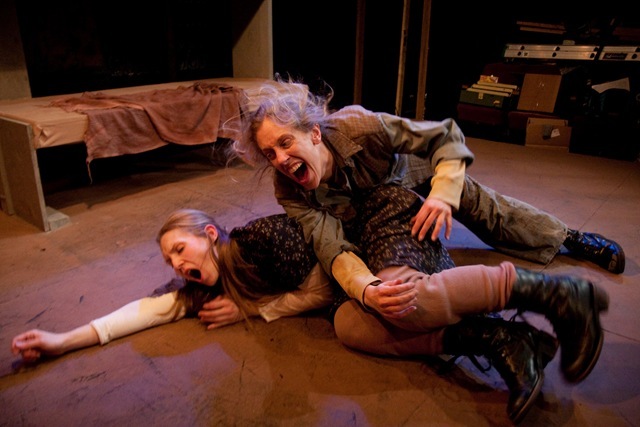 Her sister, Antigone (Sarah Scanlon), is dead and buried, making Ismene the last of her bloodline. Now a mournful Kreon (Michael Sherwin), her uncle, rules her dynasty’s city. Creon’s judgment has always been suspect and now crumbles under the guilt of the deaths of his son Haemon and Antigone. If only Ismene could break the original curse that has brought her family and city low, she might be able to rebuild Thebes after its terrible period of war and strife. 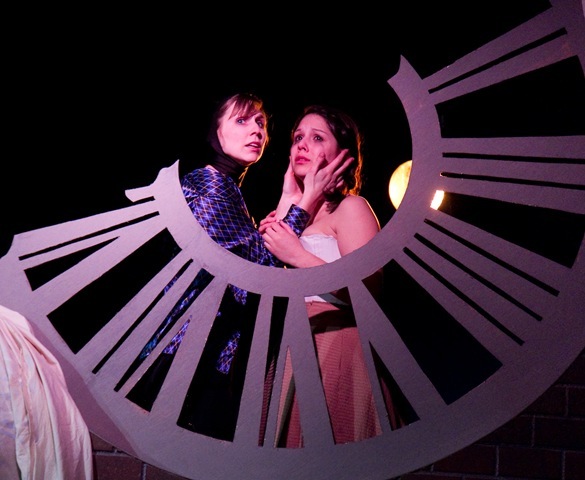 Ismene escapes Thebes to seek Theseus’ counsel at Athens, accompanied by her ruddy servant Zeva (Eleanor Katz). On the way, three Athenian women, Amaranta (Mandy Walsh), Cassia (Jasmine Ryan) and Alcina (Katie Mack) redirect her to the Oracle at Delphi. 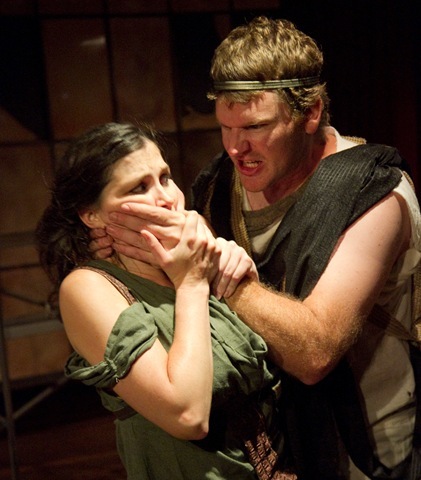 Theseus had just departed to march on Thebes and now Ismene must consult the Oracle in order to understand and break the curse before war breaks out in earnest between her city and Athens. All the while, dark dreams of her incestuous mother Jocasta and her doomed sister Antigone haunt Ismene, driving her onward but giving her no rest or hope. Soon it becomes apparent that Ismene’s dreams and visions are not just in her head but, rather, originate from the ancient Furies who act to fulfill the curse against her family. Tara Branham’s direction reigns almost effortlessly over the smooth flow of action from fight scene to fight scene. 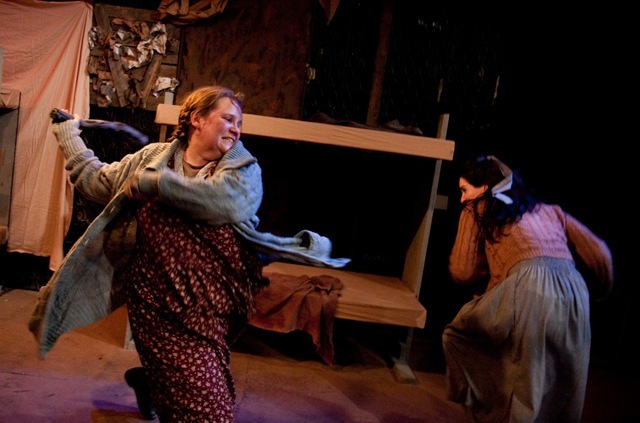 Additionally, her incorporation of Mercedes Rohlfs’ movement direction with Libby Beyreis’ fight choreography truly inspires and evokes stronger veracity for the play’s supernatural elements. 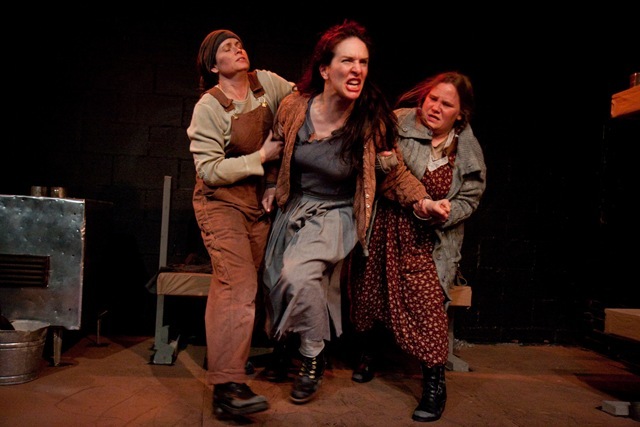 The dreadful Furies, Tisiphone (Moira Begale-Smith), Alekto (Amy E. Harmon), and Megaira (Sarah Scanlon), recall the Witches in Macbeth or the ghost of Hamlet’s father, who could be leading the protagonist to truth and/or destruction. The Last Daughter of Oedipus exhibits increasing theatrical depth for Babes With Blades, in both its writing and execution. Lighting (Leigh Barrett), sound (Stephen Ptacek), and costumes (Emma Weber) reveal a powerfully cohesive artistic vision. Furthermore, this play re-awakens, for modern audiences, the original purpose of tragedy in the city-state of Athens, which was to use familiar myth cycles to examine social and political challenges for the health of the state. Ismene’s final monologue before the end of the first act interrogates the sources of terror as much for our own times as for her own. 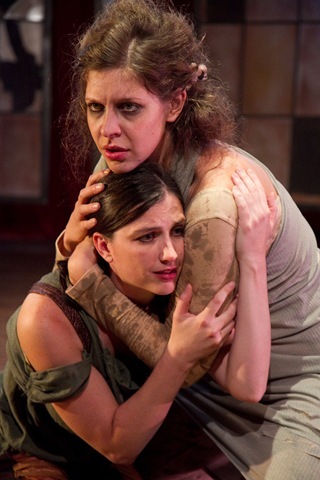 Kimberly Logan brings intelligent desperation to her interpretation of Ismene. The role itself swings from feeling badly to feeling less bad to feeling profoundly bad before Ismene’s final redemption in the underworld. It’s up to supporting characters to realize the plays’ lighter side—to which end, Harmon’s turn as the Pythia at the Oracle of Delphi makes for amazing and insightful comic catharsis. Here is a scene that both spoofs and takes seriously our era’s Goddess spirituality movements. If there’s any fault to be found, it’s in pacing problems, which could easily be resolved in the course of the run. The cast has mastered Mickelson’s heightened language for intention and now needs to pick up the pace in some scenes for crisper realism. As for the fight scenes, standard to BWB productions, a bit too much control undoes the edge that makes for the realistic and thrilling danger of actors swinging swords around. The cast shouldn’t hurt themselves, but they’ve got to make it look like they could! Of the very few venues in which Attic women actually held power, the exercise of religious offices and duties gave them the greatest social prestige and political influence. Hence, it’s only logical that Babes With Blades’ latest production sees Ismene battling with supernatural forces beyond her control. Yet, it is the their theatrical handling that displays the company’s increased sophistication in its mission to train women in combat roles and develop new dramas featuring fighting roles for women. So much about A Gulag Mouse feels like an old-fashioned, post-World War II thriller. Showing now at Trap Door Theatre, this award-winning original play by Arthur M. Jolly is densely packed with dark suspense, non-stop tension, well-timed action scenes, and black humor precisely placed and played for all its grim power by the cast. Only . . . only . 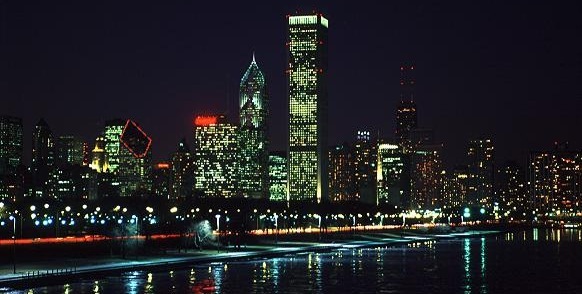 . .
Only – its story is set in the Soviet Union after WW II–perhaps not a plotline chosen for development in Hollywood during those dangerous post-war years. 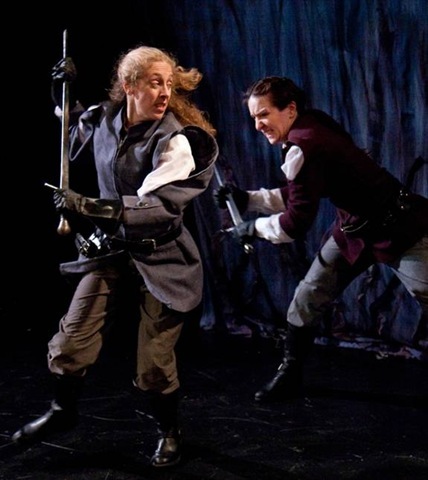 Only – it has an all-women cast, trained by the intrepid Babes With Blades, the production company that “showcases the strength, vitality, and proficiency of women in the art of stage combat.” Yet another reason why this story would not have come out of Hollywood after the Second World War. With the war over and men coming home, media moguls in America quickly shifted film and television iconography from Rosie the Riveter, and other powerful women’s roles, into the docile, domestic goddesses of the 1950s–something to think about, as you gaze at the Russian versions of Rosie smiling from the period Soviet posters integrated into the set design (Jeff Lisse). 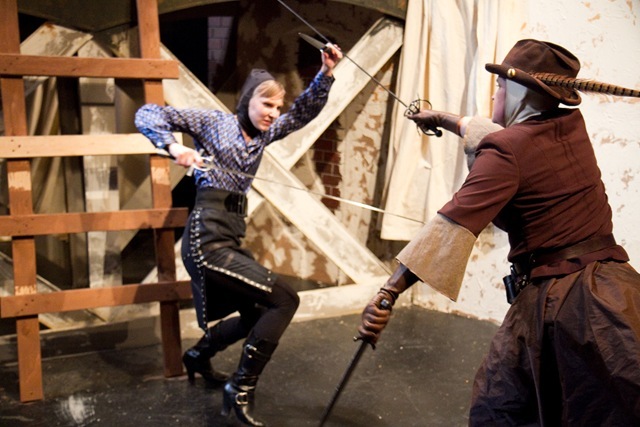 Playwright Arthur M. Jolly won the Joining Sword and Pen 2009-2010 competition for this work, an award sponsored by Babes With Blades to generate good, solid playwriting for fighting women actors. BWB also workshops with its playwrights to achieve the right balance of drama with action and Managing Director Amy Harmon, who plays the role of Masha, informs me that playwriting quality has definitely gone up since they first held the competition in 2005-2006. The playwriting shows real quality. It’s still a dark, noir-ish thriller, but it’s a thriller with a brain, showing historical and cultural sophistication. Its language leans toward the melodramatic side, but so does a lot of that old thriller stuff, and the cast, wisely, does not over play it. The young, beautiful, terrified Anastasia (Gillian Humiston) waits on a Moscow street for her husband Evgeny (Dustin Spence) to return from his service at the Eastern Front after the war. We soon learn the reason for her terror. Evgeny’s sadistic nature and abusive relationship with his young wife quickly reveals itself–exacerbated, undoubtedly, by the horrors he has had to survive. 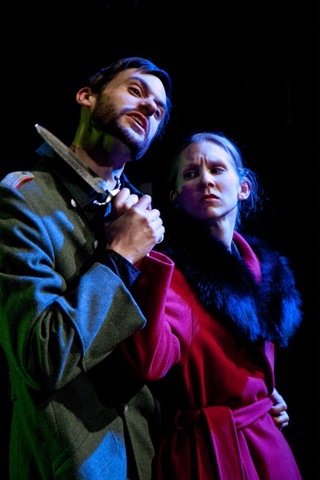 Svetlana kills Evgeny with the knife she has brought with her, but that simply propels her into the Siberian Gulag, where she faces greater dangers from her fellow female inmates. The story shifts back and forth from mental to physical fights for survival between the women prisoners. But this is no Co-ed Soviet Prison Sluts. Both playwright and production take their subject very seriously, although there’s still honest fun to be had watching women battle each other. Overall, there’s an artistic cohesiveness to the storytelling that seemed lacking in the last Babes With Blades production I critiqued. Director Brian Plocharcyk keeps a sharp pace with the cast, so there’s never a dull moment from dramatic scenes to fight scenes. Blocking alone informs so much of the characterization here, whether an inmate strolls arrogantly to the center of the stage or cringes defensively in a bunk. 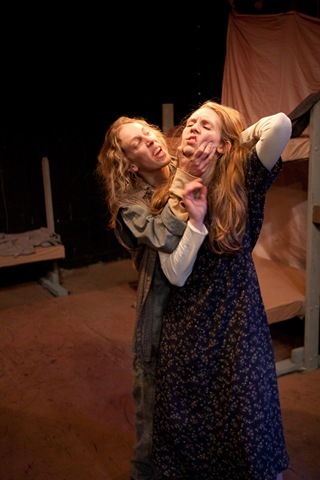 Fight choreography (David Woolley and Libby Beyreis) also serves to inform the audience about a character, crafted to exhibit a woman prisoner’s willingness or reluctance to engage her opponents. Woolley and Beyreis do a lot with the limitations of Trap Door Theatre’s space—they go almost unnoticed in the course of the storytelling. Lighting (Leigh Barrett) and sound design (Adam Smith) add tension to the story and reveal its poignancy. Babes With Blades is close, so close, to having it all come together perfectly. There’s still some unevenness in the casting and a bit of woodenness in the acting. All these fierce women actors need is just a little more technique to sharpen the spontaneity of their performances and they would have a devastating production on their hands. 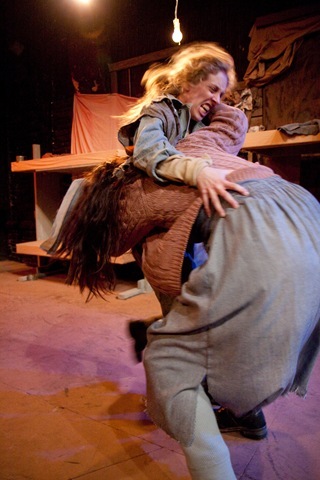 Powerful women actors in powerful roles doing physically powerful things on stage—it’s almost all there. And what is there, while not perfect, is definitely worth seeing. So whether you want to support the Babes in their endeavors or you’re just looking for a smart, thrilling ride, A Gulag Mouse will not disappoint. They dare do all that may become a man in this Babes With Blades all-female production of William Shakespeare’s Macbeth–from vying for honor, to scheming unholy murder; from wavering in the face of evil, to charging recklessly into carnage; from chafing under oppressive surveillance, to engaging in out-and-out rebellion; from enduring unspeakable loss, to succumbing, as one’s life drains to nothing. 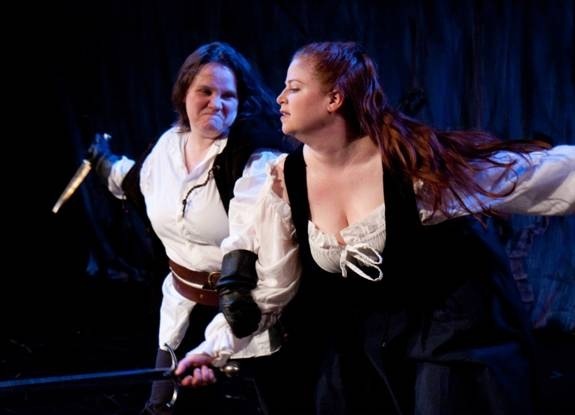 Directed by Kevin Heckman of Next Theatre for this production, Babes With Blades is an all women’s theater troupe. 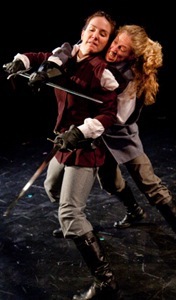 Their mission is to provide women with stage combat skills, to expand powerful fighting roles for women in drama, and to undermine “the preconception that strength and power are inappropriate for women.” Yet their work also helps to preserve and update the craft and discipline of stage combat for all actors, which often goes by the wayside when theaters downsize casts and drastically cut scenes. Unfortunately, removing traditional battle and fight scenes from plays like Macbeth, while understandable for the modern, minimalist, or cash-strapped production, can have the unwanted effect of diminishing the gravitas of the characters’ choices. The other challenge for companies like these is finding the theater space that will support battle. La Costa is a little hole-in-the-wall theater that one could walk by but for the sandwich-board sign demarking its location, but it has enough stage area plus plenty of routes for exits and entrances. The troupe rushed to find it in 48 hours after losing their previous theater space in Pilsen. Very likely, what teamwork was needed to produce these battle scenes has strengthened the cohesiveness of this ensemble cast. In fact, their collective paranoia under Macbeth’s gory, volatile regime is performed so convincingly that, by the time we see Macbeth (Kathrynne Wolf) at Dunsinane, we feel the suffocation of tyranny as palpably as Hitler’s last days in the bunker. Here, the young girl players from The Viola Project are cast to greatest effect, as children dressed in uniforms and thrown into battle because Macbeth’s thanes have all fled to his enemies. The most dramatic scene may be of Lady Macduff (Rachel Stubbs) taking up arms to defend her home and child from Macbeth’s assassins. Although, in the end, the showdown between Macbeth and Macduff (Amy E. Harmon) was so anticipated and so well executed, it received its own applause. What is the theatrical impact of seeing women fight for themselves, their loved ones, their country, or their ambitions? 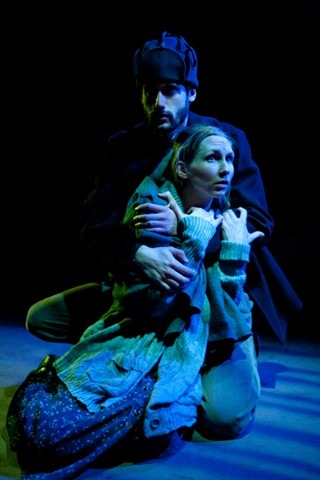 Be prepared to see, by contrast, a still forceful yet vulnerable and human Lady Macbeth (Nika Ericson). Unlike productions that suffuse Lady Macbeth with sexual and demonic power, both Ericson and the direction show a woman as much under the influence of the Witches (Rachel Stubbs, Melanie Kibbler, and Gillian N. Humiston) as her husband. After the disastrous banquet wherein Banquo’s ghost appears, during which Macbeth freaks out enough to brandish his knife in the guests’ faces, Macbeth slices his hand and pours his blood into a cup. At that moment, Lady Macbeth realizes she has no control over the evil she has unleashed. It is a moment of pure horror. Furthermore, the scenes between Macbeth and Lady Macbeth potently render, in agonizing increments, their relationship’s progressive disintegration. This production does not overplay this couple’s sexuality, yet illuminates their essential, integral partnership, before, during, and after their downfall. 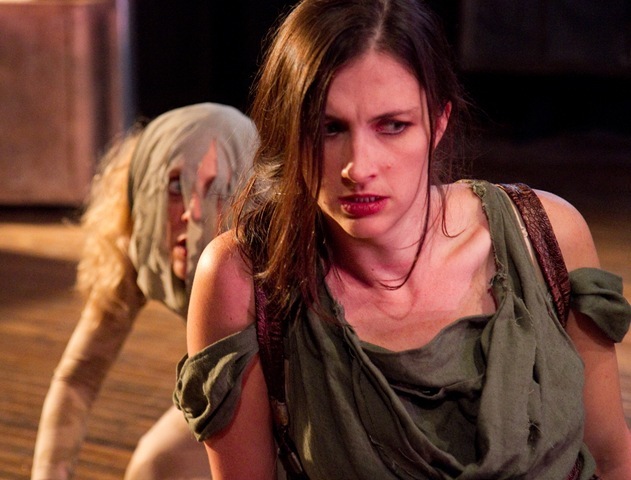 Kathrynne Wolf’s Macbeth is also vulnerable. While this vulnerability brings Macbeth’s character closer to Hamlet’s, especially when vacillating over murder, it differs by exposing his lack of a moral center. It is this lack of center, more than fear or astonishment, which prevents him from accosting the Witches just like Banquo does. Stephanie Repin, as Banquo, conveys the honor and judicious caution of a morally stable foil. The rub for this production remains Macbeth and Lady Macbeth’s most famous speeches. These are always troublesome challenges for every actor because they are, for lack of a better word, accursed by comparisons to past performances. They are operatic in nature. Like arias, the soprano and tenor are expected to step downstage and blow the audience away. That being said, the limited mastery of such critical moments makes this Macbeth an uneven, if exciting production. Particularly Lady Macbeth’s opening “invocation” speech–I question the effectiveness of the director’s choice to have the Witches take over whole lines of Lady Macbeth’s. Far more effective was having the Witches chant specific words within Macbeth’s lines, to emphasize their encroachment on his mental state. The action and pacing never flags, however. One can be assured of a thrilling demonstration of women’s strength and ensemble unity in the delivery of this classic tale about the battles within and without the human soul. 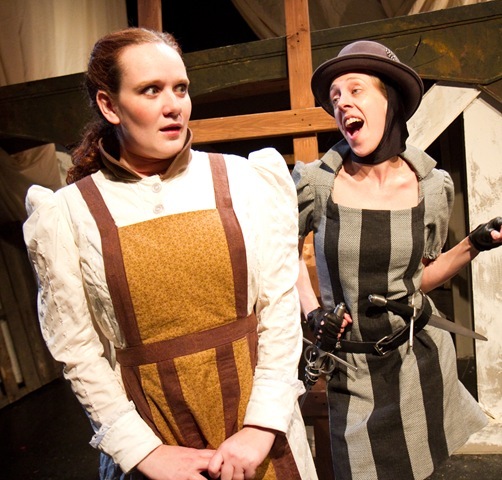 The Viola Project introduces young girls to Shakespeare and trains them in both male and female roles. The young actors playing in this production trained in a stage combat workshop in 2006 sponsored by both Babes With Blades and The Viola Project.